A Snowy Owl was found last week in eastern El Paso County while I was still driving back to Colorado. Though not as rare to Colo as the Northern Wheatear was to Texas, Snowy Owls are still quite rare and enjoy considerable attention by Colorado birders. It was nice to see one of these beauties again. This series of pics of this Snowy Owl is a progression of views from most distant to closer. 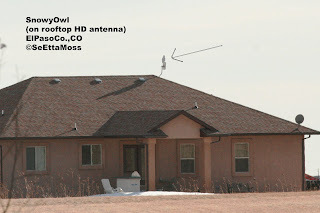 In the top pic, the owl had flown from the top of a home in this rural subdivision where it has been seen for well over a week and can be seen on a distant rooftop where it perched on the HD antenna as shown by the arrow I sketched. In the middle pic the owl is perched on the highest point it can get to--on the HD antenna. Note the whitewash beneath this antenna which is evidently a location this owl has used on a number of occasions. I cropped the middle pic to obtain the closer view in the bottom pic of the owl on the antenna.